Assemble the hard disk drive parts. Interactive structure. 18 useful hotkeys, everyone should know. Online learning games about computer science and technology. IT games to practice and study computers. 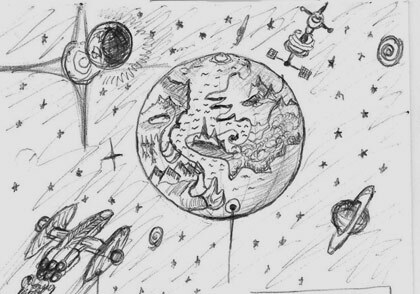 More than 60 online games related to different IT, computers and informatics subjects, that may be used for fun, interactive education and examination. Information Technology and Informatics classroom tools. The computer science knowledge games are small flash games, up to 1.5 MB, which include puzzles, mosaics, arcade games, card games and online tests with integrated valuation system. These educational applications include most of the basic knowledge, needed to be able to work efficiently with the computer and studied in information technology and computer science classes. A range of IT subjects, like computer parts, numeral systems, units of information, software programs, hardware components and networks are designed in a fun interactive way for exciting learning. The IT learning games are suitable tools for education, examination, references and recreation. They may be played at home, in schools, in class. Interactive online classes. Fun educational games about IT and Informatics. Simple Computer Navigation - Pass the steps to learn computers. Supercomputer Applications - Sort the purpose of the supercomputers by color. Supercomputer Properties - Sort the statistics of the supercomputers by color. Mobile Generations - Put the device in the correct mobile generation. Display Resolution Match - Card game with standard display resolutions types. Smartphones Match - Card game to memorize and match smartphone types. Computer Components Match - Card game to memorize and match 12 computer components that may fit inside the tower case. 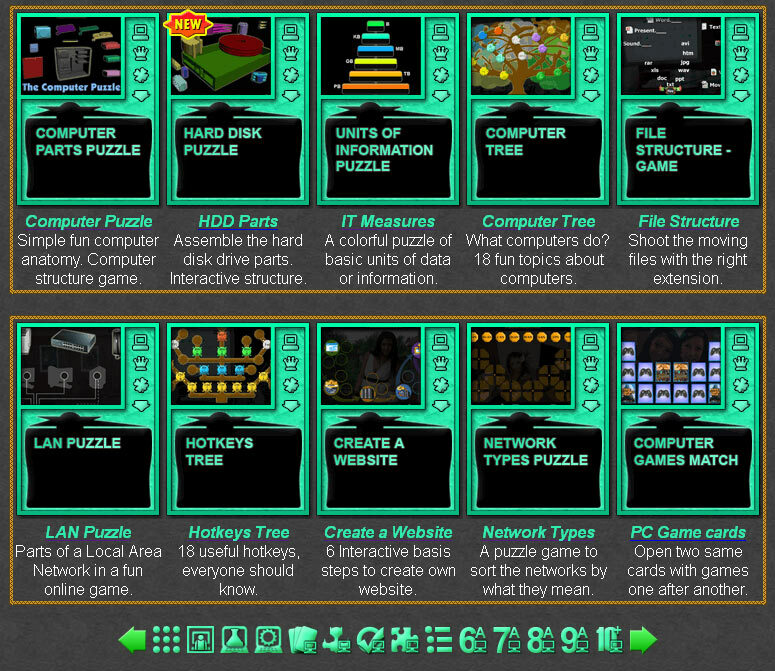 The "Cyber Network" is a free online education website with small IT games, tests and puzzles played online in the web browser. All games are free and run on medium class computers, tablets and laptops, with installed flash player. When completed they reward +1 Knowledge Level for every won game. Educational Multimedia IT for all ages. Free to play and download without registration. There are now 36 IT games - one for every school week. Prepare for early and secondary degree in computer science, information technology and informatics with fun educational games, suitable for e-learning and online classes. Free online games to practice and learn computers. IT Puzzles - This collection includes various drag and drop technology objects, square rotating puzzles with a picture of important computer parts or whole computer systems and other sortable data about digital world. IT Picture Tests - This collection includes free online tests where the answers are only pictures. They have integrated valuation system and give a nice school mark to put in the pupil's diary. Computer Science Games - This collection includes online games to study theoretical knowledge about computers, computer vocabulary and activities for computers. Computer Technology Games - This collection include games to study the hardware, interactive structures and assembly part puzzles. Software Games - This collection includes all games about computer programs, games, and program utilization. Hardware Games - This collection includes all games about computer parts, peripheral devices, network infrastructure and more. IT Classroom Games - This collection includes interactive practical occupations for computer technology calsses, homeworks and examination. IT Card Games - This collection includes fun card games to play with combinatorial computer science knowledge. IT Arcade Games - This collection includ games, played with the keyboard and fun computer science subjects. IT Mosaics - This collection usually involve playing with the mouse and sorting IT knowledge in colorful patterns, filling empty spaces. IT Grade Tests - This collection include more complicated tests for higher grade in IT. They are usually based on one or more preceding games. Informatics - This collection includes all games about subjects studied in 9 grade Informatics at school. IT for Kids - This collection include games with simple knowledge about computers, where IT usually begins to be studied in most of civilized countries. IT for 7th Grade - This collection include games for advanced level of computer science knowledge. IT for 8th Grade - This collection include more complex games about computer technology knowledge. IT for 9th Grade - This collection include fun learning games in iformatics and programming. IT for Students - This collection include games for expert knowledge about computer science and digital technologies. Nerd Games - A collection of computer technology games for nerds. The Cyber Network website includes: minute to win it games, computer science games, fun learning IT games, fun educational IT games, online IT learning games, online educational IT games, fun school information technology games, online school games, free educational IT games, free learning games for information technology, free IT school games, IT lesson games, online educational games, free online games, fun IT educational games, fun online games, fun class games, IT games, fun information technology games, online IT games, informatics class games, educational IT games, interactive knowledge boards, IT knowledge boards, interactive classes, IT knowledge games, IT tests, online tests, online IT tests, IT picture tests, fun IT games, short level games for IT and more than 60 online games related to different IT, computers and informatics subjects, that may be used for fun, interactive education and examination. Here is the blog with the Exciting Information Technology Games Collection.